My family was in town for 19 days and it was awesome! There was no way I was blogging during that time because family time is precious but now I'm back and want to check in with you all! It's officially summer in Kansas. It has been in the 100's this past week and is super hot! 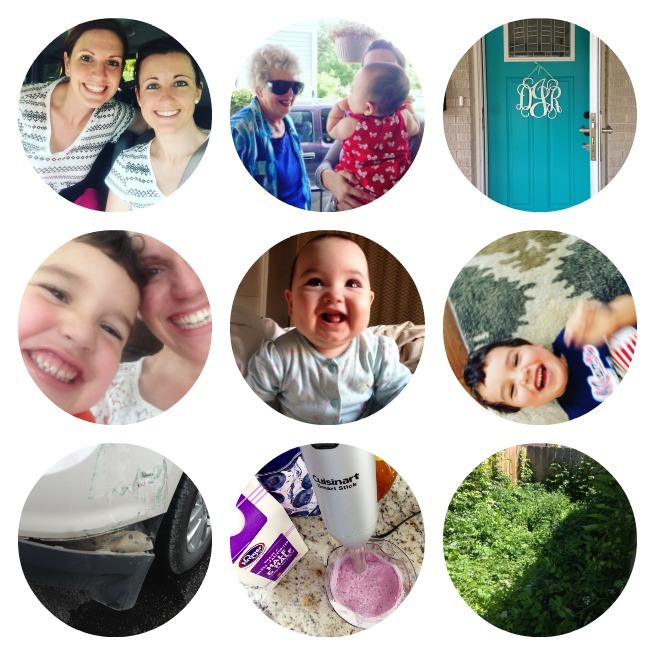 I thought I'd do a little Life Lately round up today to fill you in on what has been going on in our lives these past few weeks. 1 - I've decided that friends that have matching shirts stay together. Right? ;) Actually a while ago we went to KC and were at the Gap Outlet. I found this shirt that I loved and my good friend tried it on too. Well, she took my shirt and purchased it for herself and I didn't realize until I got home. So the next time she was at the Gap Outlet she picked me up one and now we match. ha! 2 - My granny got to meet her great granddaughter. It was precious! I'm so thankful I still have my granny around. She is one neat lady. 3 - My doors were a burnt red and that color just wasn't me so I painted all three doors teal. They look lovely and I'm happy with how they turned out. 4 - 6 - My nephew and niece. Seriously! They melt my heart. 8 - Do you love smoothies? Then I have the best recipe for you: frozen blueberries, 1/2 & 1/2, yogurt and local lavender honey. Sooooo good! I've made this multiple times and love it. I can't tell you measurements because I just dump stuff in until it tastes good. 9 - VINES!!! I hate them! That little patch is behind our garage. Just a couple of months ago I could walk back there and then BAM! Vines! Everywhere. They are already growing up the back of our garage and are so hideous. I cut out all the vines behind and beside our house as well as the ones going up our neighbors fence and now I need to tackle this area in the back. Whoever planted vines here previously had a terrible terrible idea! Has anyone had any luck getting rid of vines? Other than that we are figuring out what day to day life looks like for us. Dave's work schedule is all over the place, some days he works mornings and some days he works a weird 5pm - 3am shift, so that has been an adjustment. I'm starting to work in the morning and evening which puts me in the pool for about 5 hours, and lets just say I permanently smell like chlorine. Believe it or not we are still adjusting from moving back from Asia. Not so much cultural wise but just starting life over and to be honest it's been down right hard at times. For example, Dave's work offers health insurance. For him it is $23 per month (awesome!!!) and to add me on it goes up to $590 a month (not so awesome). So, I've been searching far and wide to find insurance for myself. Obamafail (also known as Obamacare) has made it extra difficult, don't even get met started. If anyone has any good insurance recommendations please do share. This past week we finally got our DL switched from OK to KS and now we need to get car titles and tags. Things do get done it has just been a longer process than what we expected. How has your summer been so far? What has been your favorite part? Have you ever painted the doors in your house? If so, what color? And please do share your favorite smoothie recipes! That smoothie sounds SO delicious! Any smoothie with half and half is a smoothie for me. Obamacare is just...the worst, but a necessary evil for us at the moment. My husband's insurance went from sort of affordable for just him to over half his monthly salary every month once our daughter was born and I quit my job. I wish I had advice for you, but I'm living the same frustration. The blueberry smoothie sounds awesome! !